The first thing you need is some sort of Ubuntu installation disk, usually a CD or flash drive containing the <a href=”http://www.ubuntu.com/getubuntu/download”>Ubuntu CD image</a> (ISO file). There are several good tutorials available on the net, depending on what type of computer and OS you’re currently using, so I’m going to assume you’ve got this part done already. The second thing you need is a computer with a hard disk that you are prepared to wipe clean. This doesn’t have to be anything special, even for a server, just a normal desktop machine from the last 5 years. My computer has a 4 core processor from last year, 4 GB of RAM, a 500 GB hard disk, and a decent graphics card. My server has a 2 core processor from 3 years ago, 2 GB of RAM, a 1 TB hard disk and a low-end graphics card. My wife’s computer has a single core processor from 5 years ago, 1 GB of RAM, a 40 GB hard disk, and another low-end graphics card. Ubuntu 9.10 runs just fine on all of these machines. Once you have your computer and installation disk, you need to make the computer boot from the CD or flash drive. This often involves configuring the BIOS to boot from that device before booting from the hard disk. It may also involve pressing a certain key during the BIOS startup in order to display a boot menu. You would then select the appropriate device from this menu and tell the BIOS to boot from there. Obviously, this is highly dependent on what type of motherboard/BIOS you have, so you’ll have to figure this one out for youself. Select the first option (Try Ubuntu without any change to your computer) and press the Enter key. If you’re booting from a flash drive, depending on what tool you used to get Ubuntu onto the flash drive, you may not see these first two screens. 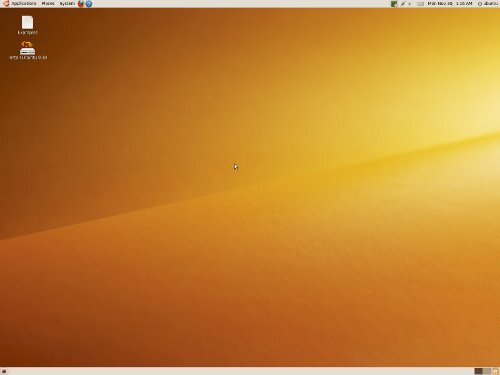 Instead, after a short wait, you will see the Ubuntu desktop as desribed next. 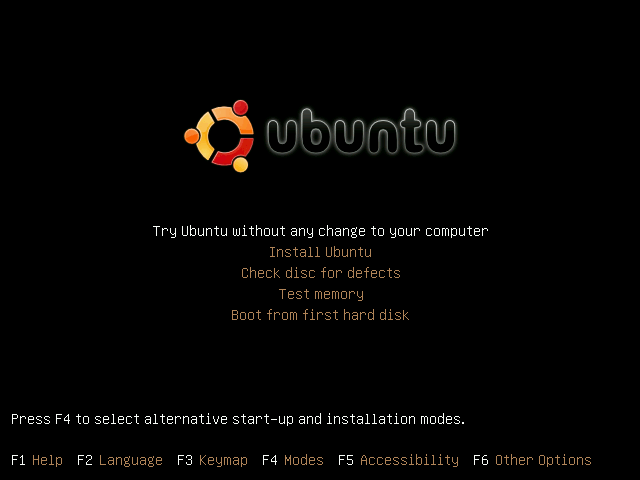 To begin the Ubuntu installation, double click on the Install Ubuntu 9.10 icon in the top left corner of the screen. This will display the first installer screen, which will ask you to select the language for the installation, which will also be used for the installed system. Select your language and press the Forward button. 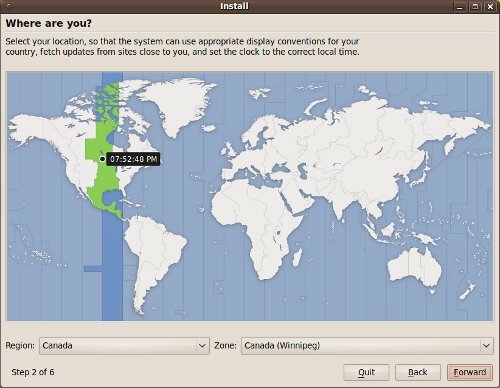 The second installer screen will ask you to select your location. This will be used to set the computer date and time, configure the display of dates and times, and choose a server from which to download future system updates. You can click on the map and then use the Region and Zone lists to refine your selection if necessary. When you’re happy with your selections, press the Forward button. 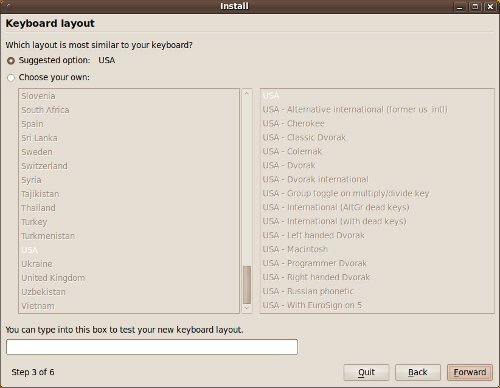 The third installer screen will ask you to choose your keyboard layout. If you’re not in North America (the default), select your country and an appropriate layout. Then press the Forward button.